Vancouver, B.C. – The Vancouver Canucks announced today the selection of Harold Snepsts for induction into the club’s Ring of Honour. The Canucks will celebrate Snepsts’ Ring of Honour Night, presented by HSBC, on Monday, March 14th during a pre-game ceremony at Rogers Arena prior to Vancouver’s game versus Minnesota. The former Canucks defenceman becomes the fourth inductee after original franchise captain, Orland Kurtenbach, former goaltender Kirk McLean and former centreman Thomas Gradin were unveiled earlier this season in the ongoing Ring of Honour initiative. 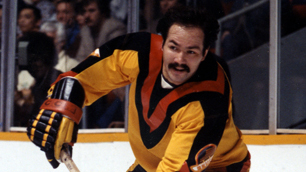 Harold Snepsts was originally selected by Vancouver 59th overall in the 1974 NHL Amateur Draft and wore a Canucks uniform for 12 seasons from 1974-75 to 1983-84 and again from 1988-89 to 1989-90. Adored by fans for a hard-working, physical style of play, Snepsts completed his career with Vancouver having recorded the most games played (781) and most penalty minutes (1,446) in franchise history. Snepsts played a prominent role in the Canucks run to the Stanley Cup Final in 1982. Through 17 games Snepsts’ leadership and robust defensive play helped Vancouver advance to the first Stanley Cup Championship in franchise history. Snepsts played a total of 44 career playoff games with Vancouver recording 10 points (1-9-10) and 99 penalty minutes. Twice named an NHL All-Star (1977 & 1982), Harold was also a recipient of the Fred J. Hume Award, given annually to the Canucks unsung hero, and selected four times as winner of the Babe Pratt Trophy, awarded to the Canucks most outstanding defenceman. Through 12 seasons in a Canucks uniform Snepsts logged 781 games, recording 195 points (35-160-195) and 1,446 penalty minutes. Snepsts NHL career spanned 17 seasons with four different teams (Vancouver, Minnesota, Detroit, St. Louis). The defenceman played 1,033 career games and recorded 233 points (38-195-233) and 2,009 penalty minutes. Since 2005 Snepsts has served as an Amateur Scout for the Vancouver Canucks. The Ring of Honour tradition launched this season and is an ongoing initiative to celebrate Canucks heroes who have made a lasting impact on the franchise. Ring of Honour candidates are selected by an advisory committee including former player and current Senior Advisor to the General Manager, Stan Smyl, Hockey Hall of Fame broadcaster, Jim Robson and former Canucks staff member of over 30 years, Norm Jewison. Further information about the Ring of Honour and the Canucks 40th Anniversary season, can be found at Canucks.com/40th.